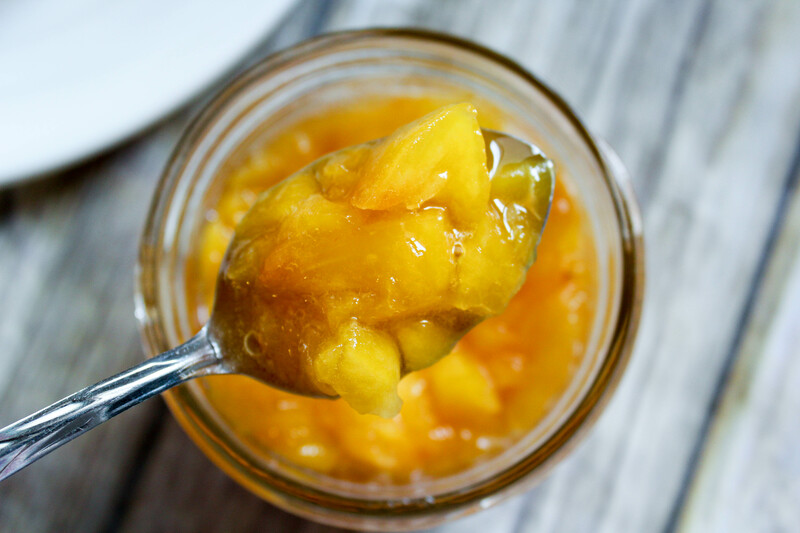 A simple, 2 Ingredient peach sauce that is ready in 5 minutes. The perfect topping for yogurt or pancakes!
. I love them and my kids love them, so that makes them a double winner in my book! You can make up a big batch of them at the beginning of the week, then pull out 3 at a time on busy mornings. I like to reheat mine by toasting them in my toaster! I have sometimes made a sugar free maple syrup (you could try this recipe from my friend Rachel), and I have even (gasp) used a sugar free store bought version. (Not a Purist here – just being honest!) 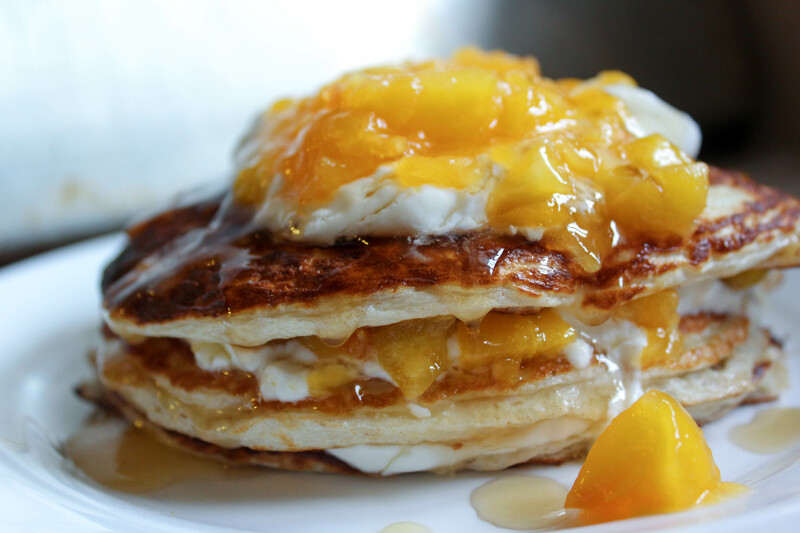 But, I honestly prefer them layered with my Copycat Vanilla 000 Yogurt and this delicious Peach Sauce. 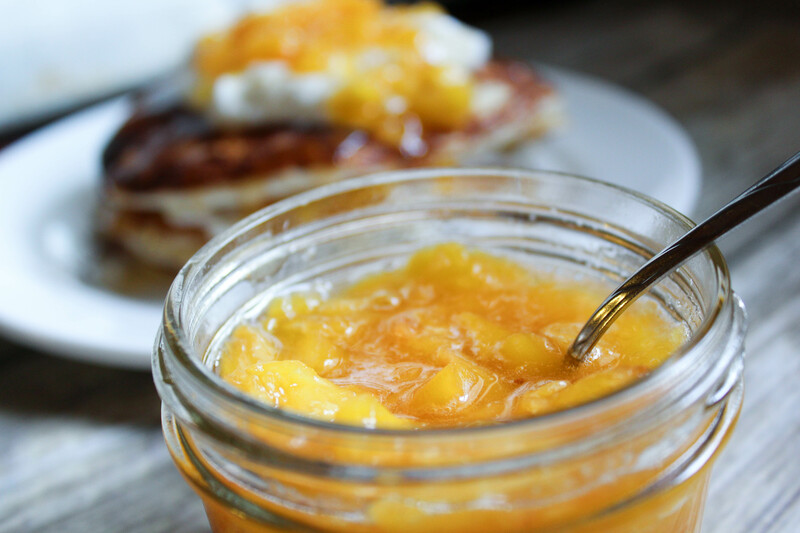 You won’t even miss the syrup, with this sweet fruit sauce! This sauce literally takes 5 minutes to make, and it is easy to whip up while your pancakes are cooking! I usually use my microwave (remember the part about me NOT being a Purist? ), but you could easily make the sauce on the stove as well. Just keep in mind that it may take longer than 5 minutes if you use the stove method. So what two ingredients do you need? tool (pictured below). It chops just about anything up perfectly! I also make this sauce with strawberries and blueberries. Really, you could use whatever fruit you have on hand. The peaches are an E fuel, but if you used strawberries, this sauce could easily fit into FP mode. Place the peaches and sweetener in a microwave safe container and microwave for 2 minutes, then smash the peaches a bit. Microwave for two more minutes, then finish mashing the peaches into a sauce.